Thank you to Two Writing Teachers for hosting the Slice of Life Challenge. "Annie," I called as she walked in the door. "Don't faint." "Did you make dinner?" she asked. How sad is it that my Slice of Life is about making dinner? If you read my post about the salmon, you'd understand. Tuesday's Open House delayed the salmon one more night and I thought I might possibly be able to cook it last night. Alas, I received a text from my husband at 2:30 yesterday afternoon saying that we had a request for potential buyers to look at our house at 6:30 that night. 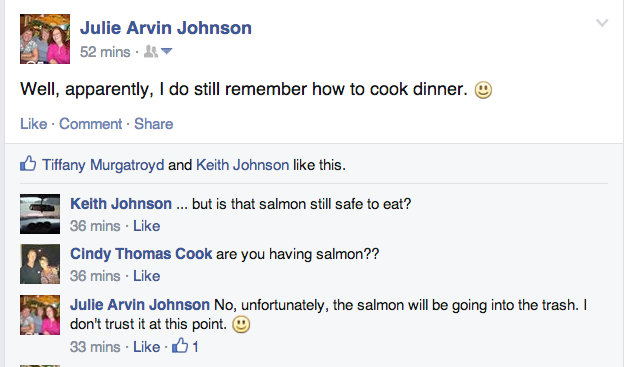 No one wants to buy a house that smells like fish, so the salmon did not get cooked last night either. Sadly, in order to avoid potential food poisoning, I decided that the salmon had to go. BUT, I did get home in time to make dinner tonight~ pierogies, roasted broccoli and asparagus and homemade sausage from the local butcher. Granted, the peirogies were Mrs. T's, but I still had to saute the onions and add the frozen potato and cheese stuffed pasta to the pan; so I think it counts as something. I'm pretty sure my husband wondered who the woman was standing at the stove when he walked in the door. Dinner sounds wonderful! I have really had a hard time getting meals in too. (You have just inspired my post for tomorrow!) Spring break is next week and my family won't know how to act with meals every day! Welcome back to the stove! :) It seems your family is appreciative when you make dinner. Sorry about the salmon but I think you made the wise choice to discard it. Otherwise this may have been telling of a most unfortunate turn of events. Your dinner sounds pretty fabulous! Too bad for the salmon. I am sure it would have been great yesterday! Happy cooking! :) Too bad about the salmon - but tonight's dinner sounded delicious! Dinner sounds delicious! It is so difficult to juggle the "normal" things and you've got an extra challenge trying to sell your house. I hope the showing went well! I just read Leigh Anne's post, and she said hers was inspired by yours, so I came by to read it. ;-) Like I told Leigh Anne, I'm dismally unprepared as a cook, and my poor family rarely gets a home-cooked meal. I feel badly for them, but I can't seem to fit it into my schedule! Ugh. Fortunately, we have Dorothy Lane Market close to us, and we stock up on food that SEEMS homemade by me. ;-) I think your dinner sounds yummy!